Peel ripe bananas and slice about 1 1/2 inch in length. Take a wide straw and punch a hole through the middle of the banana slice (as shown in picture above). Place Nutella in a piping bag. You may want to chill in fridge a few hours before to make it easier to pipe. 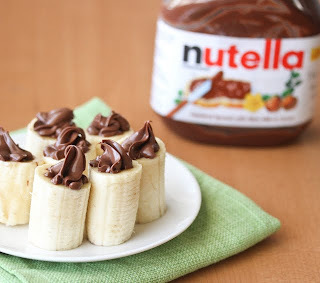 Pipe Nutella into the middle of the bananas. Careful not to pipe all the way or else Nutella will fall out of the bottom. Serve immediately.